At the installation meeting of Blundellsands Chapter No 2289, which took place at the Adelphi Hotel in Liverpool city centre, the companions of the chapter were delighted to welcome Assistant to the Provincial Grand Principals Samuel (Sam) Robinson, as principal guest and representative of the Grand Superintendent Tony Harrison. Sam was particularly pleased to be accompanied by a number of other grand officers, namely John James, Keith Sanders, Mark Dimelow and Gladstone Group Chairman Bill Culshaw. Pictured from left to right, are: Robin Miles, Mark Dimelow and Alan Morris. After the first principal Mark Dimelow, had opened the chapter, the scribe Ezra Peter Hesketh, read the dispensation to allow Mark to continue in the first principal’s chair for a third year. 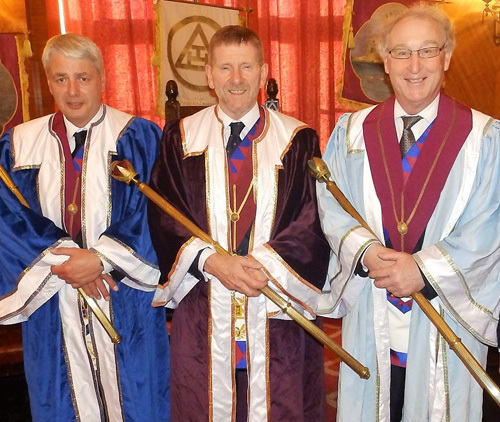 The three principals then formally welcomed Sam into the chapter, after which Peter Hesketh proclaimed the first and second principals, Mark Dimelow and Robin Miles, indicating that they would continue in office for a further year. Alan Morris, the elected third principal, was then installed into his chair by Robin Miles, who subsequently delivered the appropriate robe address to him. The appointment of the chapter officers then followed. It was sad to note that after many years the chapter now had a new treasurer, following the retirement and resignation, due to health reasons, of Derek Vaux. The appreciation expressed of his efforts on behalf of the chapter were recorded by the scribe Ezra, who will write to Derek accordingly. At the conclusion of the ceremony, Sam rose to deliver the congratulations and best wishes, on behalf of the Grand Superintendent, to those who had taken part in what was, by necessity, a short but nevertheless most enjoyable ceremony. Mark, on behalf of the members, thanked Sam for the sentiments expressed and presented him with a donation from the chapter to the MCF 2021 Festival. Sam accepted the donation gratefully on behalf of the intended beneficiaries. A convivial and lively festive board followed in the Crosby Suite of the hotel, during which Sam was pleased to respond to the toast to grand officers, in a style which both humoured and informed all present. During his response he mentioned the donation of two brand new motorbikes from the WLFC to the North West Blood Bikes, the relevance of the continuing need to support the MCF 2021 Festival and several other important topics. He also thanked the chapter for their charitable donation earlier in the evening. In conclusion he offered his congratulations to the companions of the chapter who had taken part in the earlier ceremony and conveyed his best wishes to all present. As the evening drew to a close, the immediate past first principal Peter Gaskin, proposed a toast to the health of the three principals, wishing them a happy and successful year ahead. In response, Mark thanked Peter for the toast and on behalf of the chapter thanked Sam and all the guests for their attendance, hoping that they had had an enjoyable and memorable evening. The festivities were brought to an end with the janitor’s toast. Pictured from left to right, are: Daniel Senneck, Keith Sanders, John James, Sam Robinson, Mark Dimelow, Bill Culshaw and Mike Cunliffe (Woolton Group Vice Chairman).